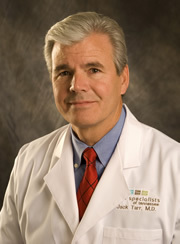 Named one of the Knoxville area’s “Top Doctors” by other physicians, Dr. Jack Tarr is a veteran of the U. S. Navy who has been practicing in East Tennessee for more than 30 years. He earned his undergraduate degree at Carson-Newman College in 1972, and his medical degree from University of Tennessee, Memphis in 1975. He did his residency in Family Practice with the Navy Medical Corps in Jacksonville, FL. Dr. Tarr and his wife, Kathy, have six children: Nathan, Ashley, Brittany, Taylor, Brandon, and Chandler. When not helping patients, he enjoys family activities, hiking, golf, tennis, and lay church leadership.